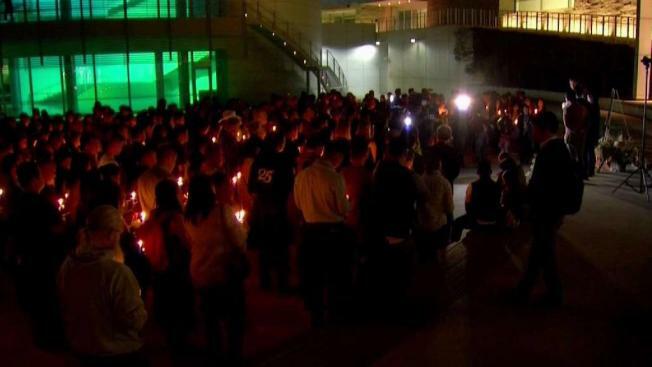 More than 200 people came together at San Jose City Hall to honor Michelle Vo, one of the victims who was gunned down in Las Vegas on Monday. Ian Cull reports. More than 200 people came together at San Jose City Hall to honor Michelle Vo, one of the victims who was gunned down in Las Vegas on Monday. “It feels like a dream, you think I need to wake up from this dream but it’s not, it just doesn’t end,” said the victims oldest sister, Diane Hawkins. Michelle Vo grew up in San Jose, attended Independence High School and worked at Synopsis in Mountain View. Most recently, she was working as an insurance agent in Los Angeles. She was the youngest of four children who loved golf, cheering for the Golden State Warriors and most of all travel. She was at the Route 91 music festival, which was on the last of its three days, when Stephen Paddock opened fire into the crowd of nearly 22,000 people on Sunday, police said. It was clear during the vigil that the life Michelle Vo led couldn’t have been done any better. The family is working with the coroner in Las Vegas to bring Michelle Vo’s body back to the Bay Area and are hoping to hold a funeral next week. From the 32nd story of the Mandalay Bay and Casino, the 64-year-old man was able to shoot and kill at least 58 people – including Michelle Vo – and wound another 527. When he was found dead of a self-inflicted gunshot, the Nevada man had nearly two dozen guns, including semi-automatic weapons that had been modified into automatic firearms with the help of bump stocks, according to police. Michelle Vo’s mother, though emotional at the knowledge that her 32-year-old daughter’s life had been cut short, said she is not angry at Paddock. Instead, Hana Bui said she wants to focus on her child’s life. Michelle Vo sent her sister a photograph of herself at the concert shortly before she was shot and killed. Her family believes she died instantly. The gunman may have snuffed out the Vo family’s guiding light, but Cathy Vo and Hana Bui take comfort in the knowledge that Michelle Vo brought joy not only to their lives but also to the lives of many others.